Lack of prioritization leads us right into the trap of an overflowing calendar, guilt for not “getting anything done”, not being able to say no, frustration and overwhelm. It’s up to us to set our own priorities in order to keep ourselves focused, productive and successful in our goals. 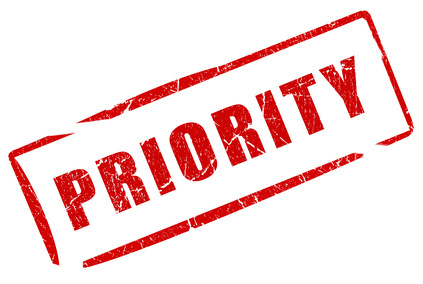 In order to learn and practice the art of prioritizing, we need to get clear in our heads about what our priorities are. Questions we can ask ourselves in order to set these priorities are: What are the things I want to have experienced and accomplished in my lifetime? What are my goals for today? What are my goals for this week, month or year? What are the items on my bucket list that I am truly captivated by and passionate about? What do I not only enjoy, but absolutely LOVE doing? What are the things that I am most happy being involved in? What are the activities that I dread when I see them on my calendar? What totally causes me unnecessary stress? These questions and their answers create a filter through which I can process all of my thoughts, ideas and goals. There was a time in my life where EVERYTHING was important to me….LITERALLY, EVERYTHING. I cared about reading and sewing and art and cooking and baking and gardening and running a business and having babies and keeping the babies on a schedule and shopping and creating and saving money and do-it-yourself projects and entertaining and blahblahblah…….and, finally, it all had to come to a screeching halt before my very eyes. I had some major prioritizing to do! I needed to create some filters and boundaries through which to process every opportunity and idea that came my way. Think about it like this. You have 10 boxes of stuff, but can only take ONE. ONE BOX!! What are the most important items on your list? Pack those first. Most likely, they are going to be your spouse or significant other and your kids. Please don’t forget to pack yourself, by the way! After that, it’s entirely up to you what you put into that box. I literally used to be a pack rat. After several moves, including two cross-country moves, I have simplified and learned to, not only enjoy, but actually LOVE a minimalistic lifestyle. Ask my friends. They like to give me a bad time about how little I have in my house. *cough, cough* This idea of minimalism applies to the lifestyles we live and the way we fill our schedules and use our time. Back to priorities. Once you get clear with your priorities and have your ONE BOX PACKED, SCHEDULE your priorities on your calendar! The way that I do this is to put all the non-negotiables on my calendar. This would include activities such as the kid’s sport schedules, etc. You show up at baseball practice when and where the coaches tell you. I schedule the times and days that I want to go to the gym and/or the gym classes I want to do that week. Next, I schedule my hair and nail appointments. Yep, schedule all of your self-care items for the entire year. Get them on the calendar before you realize that it has been 6 months since your last hair cut and you are feeling quite frumpy. I also have time set aside time for meditation and reading. I aim to block out one day about every month and a half to unplug and totally take the day or several hours off from kids and business. These are my hours to decompress, stay home in my pjs and watch tv, or go for a river trail run, or go shopping, or nap in the sun….whatever I want or need. Once I have family time and personal time scheduled, I have all of these empty spaces to fill with work and recreation priorities. Remember your ONE box. What did you pack? Filter all opportunities that come knocking through the filters and boundaries that you have created by prioritizing. Learn to say no. Be the leader of a wonderful life.